For more financial ideas and resources, sign up for our weekly Essential Business Nudges – quick tips to help you build your skills and build your business. Julie Stanford: Hello, I’m Julie Stanford. Welcome, once again, to Essential Business Radio. 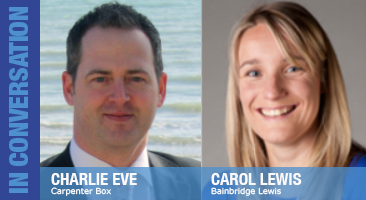 With me this time to discuss keeping the right financial records for your business are two chartered accountants: Carol Lewis, partner of Bainbridge Lewis, and Charlie Eve, partner at Carpenter Box. I’ll start with you, Carol. Tell me why you decided to branch out and start your own practice. Carol Lewis: Up until that point in my accountancy career, I’d been tied to a desk doing compliance works, doing accounts, tax returns and I was a bit bored with it, to be honest with you. I wanted to get out there and help people in their actual businesses and talk to people about their figures and their numbers, so I set up Bainbridge Lewis with a friend of mine and the idea is that we’re there to help people with more of their financial problems that they have in the business rather than just doing the year-end accounts and tax returns. We help a lot of start-up businesses, with helping them get themselves up and going. Should they be a sole trader? Should they be a company? Should they VAT register? Should they set up a payroll? That kind of thing. Carol Lewis: Yeah, there’s two of us. Julie Stanford: Someone that a business would go to just at the end of the year, for example. Carol Lewis: Oh, yep, exactly. We also help a lot of growing business as well, so people who are looking to take their businesses on to the next step who want maybe to get financed, need a business plan putting together, or need cashflow forecasting, that kind of thing, really. Julie Stanford: Excellent. Charlie, over to you. What attracted you to Carpenter Box? I know you went to them. You’ve been in practice before, but you went to that particular company not that long ago. About a year ago? Charlie Eve: Yeah, about a year ago. I was a partner in another firm and an opportunity arose to go to Carpenter Box. It’s quite a large firm, about 100 employees, so we can deal with big clients, audit clients, as well as smaller individuals and sole-traders. Julie Stanford: You’re also tax specialists as well, are you, did I see? Charlie Eve: Yeah. Again, because of the size we’re able to give all the services of a corporate finance specialist, tax mitigation services but what’s really attractive is that we’re still able to talk to the individual owners themselves, although it’s partner led. Our clients talk to the partners rather than someone else. It’s not like we see them for the first meeting and then they don’t talk to us again. We’re still very much hands-on as partners, direct-dial numbers, out-of-hours calling. Julie Stanford: I think there has been quite a sea change in the way businesses work with accountants, hasn’t there? I think that, which is a good thing, because it’s a really important role. I think there was the joke that all accountants were quiet and sitting in a cupboard somewhere working away with a quill at a desk. Those days are gone, aren’t they? Let’s think now about … So many businesses, they really struggle with the whole notion of what they need to keep, what they should be doing with the records and really what I’d like to do is think first about maintaining good financial records for a business. Now that does sound like quite a dull question, but let’s try and make it interesting. Carol, no pressure. What financial records does a business need to keep? Julie Stanford: What records, financial records, does a business need to keep? Carol Lewis: At a really basic level, the first thing I always recommend to my clients is to open a business bank account, even if you’re just a sole trader, so that you can keep records of all the money coming in and going out on your bank statements. That’s really basic. You want your business bank statements. Then you need to keep records of all your money coming in, so all of your sales invoices and all of the money going out, so all of your receipts, purchase invoices, that kind of thing. That’s the basic level. Those three things are what you need. Then, as your business gets more complicated, you start building on that. Charlie Eve: There’s many ways of recording that. Carol’s exactly right. Those are the three main things. Some people say that the ‘paper bag job’ no longer exists. It does. People will keep all their receipts and they’ll put them in a plastic bag and they’ll give them to the accountant at the end of the year. Actually, for some people that’s how they want them and that’s fine, as long as all the records are kept, the bank statements. The bank, essentially, is the cash side and the bank side is the lifeblood of the business, so you need to keep a record on that. You need to know what you’re doing and how you’re doing it. Depending on whether you’re a sole trader, a partnership, or company which we might talk about later, will depend on what the relevance is for the bank account and the transactions therein. Julie Stanford: When it comes to thinking about something a bit more sophisticated than simply … I mean, I understand what you’re saying about making sure there’s a very clear split between personal finance and business finance. Carol Lewis: Yeah, it’s really important. Julie Stanford: When we move up from that point of working from the point of a business bank account, what’s going in and what’s going out and simply recording those and keeping the evidence of them, what’s the next stage then, in terms of records? What should you use to record the information? Carol Lewis: The next stage is probably an Excel® spreadsheet. Most people can use an Excel® spreadsheet. It’s really simple, it’s free, and you just need to go and keep, say, one spreadsheet for all of your income coming in, one spreadsheet for expenses going out, and maybe another one for reconciling that back to your bank transactions. That’s the next step up, basically, if you want to keep your own bookkeeping records is, you know, we recommend Excel®. It’s the easiest, it’s the cheapest. The problem with Excel® though, is it’s sometimes a little bit too flexible, so it’s quite easy to make a mistake in Excel®. It hasn’t got some of the checks that if you go and get some of the more sophisticated bits of software like Sage, QuickBooks, that kind of thing. It is easy to make errors and then you probably need to get them checked quite carefully, the spreadsheets. Charlie Eve: You can still use a book. Charlie Eve: There are people out there who absolutely hate computers and continue to hate computers. That is a lot less than it obviously used to be, we all hope. Yes, you can still write in a red cashbook. Carol Lewis: Cathedral ledgers. Yeah. Charlie Eve: We still get that, and some people have so much pride in it. It’s incredible. They give it to you and it’s the neatest thing you’ve ever seen. Actually, if we receive information like that then we’re still able to analyse it and give useful information and advice from it, as if it was an Excel® spreadsheet. We say Excel® or computerised just because it’s quicker for the client, and that’s really what we’re trying to do. We’re trying to make an admin process as easy as possible because, essentially, recording the information for your accounting records is admin in nature. Julie Stanford: That’s the point. Julie Stanford: We’re saying that people need to have all of that information plus proof of it for you to be able to do your jobs. Julie Stanford: Then, however, I’m thinking that’s with a sole trader. When we move up to a limited company, what would be different there? I know that they can still do it in an analysis book, but is there a wider need then for records once you start to move to a limited company? Carol, what would you say about that? Carol Lewis: It’s not necessarily whether it’s limited or sole trader. I think it’s more to do with the size of the business. As you get bigger and you get more transactions going on, from a speed point of view and also from the amount of information that you need back out of your accounts, you need to maybe go and invest in some proper software to run it for you. Because if your business gets bigger, it’s not just about what records you need to keep to be compliant for the revenue. It’s about you need to keep sufficient records for your finances so that you can work out if you’re profitable, if you’re making a loss, what margins you’re going on. At that point, you need to have more detailed information and be able to access it quickly. Julie Stanford: Actually, this is a great point for me to flag up another show where the two of you are coming back, and we’re going to be talking about using this information that we’re recording for good management of the business [How to manage the money in a small business], so I’m just going to flag that show up, because I think that’s going to be a good one. Then, thinking about the length of time that these records have to be kept. I know that causes enormous confusion for businesses. With these bags of receipts and their sale invoices and the Cathedral book or the Excel spreadsheet, how long do they have to be kept for the revenue [Inland Revenue]? What do they say? Charlie Eve: Yeah, it’s the current year plus five years. Julie Stanford: Right. What does that include? What records would they expect to be kept for those six years? Charlie Eve: It would be your bank statements, it would be your receipts and your sales invoices and, if you’ve got stock, then your stock records to show how you’ve come to the stock figure at the end of the year. Carol Lewis: And paying-in books. Julie Stanford: And paying-in books? Carol Lewis: Yeah, a good point to mention here is some businesses don’t raise sales invoices, so you could go and have a shop where they’re receiving cash so you need to keep things like the till rolls for that. Carol Lewis: Nowadays, with all the website businesses, you want to be keeping, like, PayPal account prints, so you can see what money has come in through your PayPal account. I think nowadays, it’s not just invoices. Carol Lewis: There’s a lot of other records that you could use instead of that. Julie Stanford: Say, for instance, you were to have a visit, Heaven forbid, from the revenue, I assume that you have to be able to prove everything that’s coming in, everything that’s going out, so that you can say where it’s all gone and where it’s all come from for a period of 6 years. Julie Stanford: May I ask you one other question, Carol? At Bainbridge Lewis, how would you advise a client when it comes to keeping personal records as well? Is that necessary? Do they need to do that? Carol Lewis: You only need to keep personal records of the money that you’ve received out of the business, so be it your drawings if you’re a sole trader, or your wages and dividends if you’re a director. Also, any use of home stuff that you’re claiming for the cost of if you’ve got your office at home because those would be in your personal name. Your electricity costs, your mortgage interest, that kind of thing. You’d need to keep those records so that you could back up the ‘use of home’ claim that you’re making off of your business for tax purposes. Julie Stanford: Okay. Charlie, at Carpenter Box, let’s think now about virtual records. Julie Stanford: Because I’m going to throw an unusual one here. Things are changing, aren’t they? Julie Stanford: They’re rapidly changing even with the fact that some people are now using online computing software, and what happens with these, in effect, virtual records? How does the Revenue view those? What do they expect? Charlie Eve: If all your invoices and records are kept electronically, then that’s absolutely fine as long as you’ve got a back-up of that and that at some point in time you can get back to those records for the Revenue to analyse or for you to actually print out onto paper if necessary. Virtual records are like physical records. They have to be held for the same period of time, six years, but fortunately, they don’t take up as much space in your front room or your bedroom or your spare bedroom, wherever it might be. Julie Stanford: The same principle applies: Make sure you’ve either got hard copies or you’ve got access to your virtual records for that period of six years, so that you can prove that flow of money in and out. Julie Stanford: I just want to move on then to think about, more widely, the use of the records and in terms of customer records and maintaining good credit control. I get asked a lot about what needs to go on your invoice. The first thing I’m thinking about, in terms of credit control, what do you actually have to put? What information has to go on an invoice, whether it’s one online, whether it’s a printed copy? Carol, what would you advise your clients to put on their invoice? Carol Lewis: You need all the obvious stuff. You need your address, your business name. It’s important to put your VAT registration number if you’re VAT registered, the amount on there. I think it’s also really key to go and say what your credit terms are, so when you’re expecting payment. Some people give 30-days’ credit to their customers. Some say, “I want payment immediately on producing the invoice.” I think you need to make clear on your invoice what your expectation is about when you want to get paid. A good tip is always put your bank details on there, so if they do want to go and pay you by BACS, they can do. The details are right there on the invoice. Maybe say who to make a check payable to and also put a contact name and a telephone number on there, so if they had any queries about the invoice, they could quickly call up and get it sorted it out, so they haven’t got that excuse not to pay you because the details of how to get that query dealt with are on the invoice. Julie Stanford: Is there anything else that they have to put on there, or is it really the practical common-sense things to facilitate the payment? Charlie Eve: As a limited company, you have to put the registered office address at the bottom. Julie Stanford: Right. Their registration number? Charlie Eve: Yes. If you’re trading, you’ve got a trading name which is different from your company name, then the company name should be shown so that someone could go back and look at the company. Julie Stanford: On that official piece of information, really, about your business. Julie Stanford: Can I ask you another question, Carol? Do you need to have the rate of VAT on there still? Julie Stanford: I know at one point, if you are VAT registered, you actually had to separate it. Is that still the case? Carol Lewis: Yeah, and I think it’s really key as well at the moment because the VAT rate keeps changing. Having that rate on there is really important so people can say what rate’s being applied to the invoice. Yeah. Charlie Eve: Because some services might be zero rated, some might be standard rated, and some might be exempt from VAT, and all on the same invoice. Julie Stanford: Actually, that makes me think, Charlie, that when you buy something as well, I assume you also need to check that VAT information is on the receipt. Charlie Eve: Actually, quite a good one is if you get a receipt from a supermarket, most of time they’ll have a little star by certain items and the items that they have a star by are the ones that have VAT attached to them. Julie Stanford: Oh. You learn something every day. Charlie Eve: Look out for that on your next trip to any supermarket, because it might be something that you haven’t noticed before. When you’re keeping records and you’re trying to claim back VAT, that’s something you should look out for and make a VAT calculation on. Julie Stanford: Am I right in thinking that to be able to claim VAT, you do actually have to have the supplier’s VAT number on the item? Carol Lewis: Yeah. You have to have a valid VAT receipt with the VAT number on it. Charlie Eve: That’s right. Sometimes you get given a pro forma invoice so you’re paying in advance for something, but you can’t claim back VAT on that invoice. You have to wait for the valid VAT invoice to be received before you can claim it back. Julie Stanford: Actually, that’s a good point, Charlie. Do you mind explaining a little more about what a pro forma is? Because I remember when I started my business, being totally confused by the notion of a pro forma. It seemed to me to be an invoice. I couldn’t see how it was different from the following invoice which replaced it. Charlie Eve: A pro forma invoice happens quite a lot when you’re … Let’s say, you’re starting up in business and normally you might be given 30 days’ credit for something, for a service or for some product, and because you haven’t got a credit history, they issue you with a pro forma invoice to pay up-front, but because they haven’t actually supplied the service or the goods, it’s not a valid invoice, so you pay on the pro forma invoice, they get the money, they ship the goods, and then they give you a valid invoice which, well, the invoice date ties up to the delivery date. Julie Stanford: Right. That’s when the VAT is included. Charlie Eve: That’s when you’re allowed to claim. Julie Stanford: Right. It’s at that point you can claim it. I see. If you were cash-accounting, in terms of the VAT, as in when the money is actually into your bank account and actually leaves it, that would apply. Charlie Eve: Yeah, you have to have a valid VAT invoice. Julie Stanford: Okay. It’s a mine of information, isn’t it? If anyone is actually wanting to find out more, I’m sure I can … If you contact us at essential-business.co.uk and we’ll pass your questions on. Julie Stanford: Let’s think then about what else you need to do in terms of credit control. A statement, I would imagine. Once you’ve billed for the goods and you’ve put all this information on the invoice so, therefore, encouraging them to pay promptly hopefully by BACS, which is the one we all love, what’s the next stage? Supposing that person doesn’t actually pay out, what would you then suggest, Carol at Bainbridge Lewis? What do you all leap into action with? Carol Lewis: We usually drop them a friendly e-mail and go and say, “I think you’ve forgotten to pay us. Please find attached the invoice, if you’ve lost it. Please send us payment.” The thing is, if they have just one invoice outstanding, usually I would just go and send them the invoice again and say, “Just in case you’ve lost it, here it is.” If you’ve got a customer who owes you a lot of different invoices, then it’s quite useful at that point to do a statement, which is just basically a list of all the invoices and how much is outstanding on each of those invoices. Then it’s got a nice little total figure at the bottom, so the customer can see exactly how much money they owe. Then, if they’d lost any of the invoices, they could e-mail you back and say, “Can you send me a copy of this invoice because I don’t appear to have it.” Those are the two different ways that you can do the first step of chasing. Julie Stanford: For your customer to be able to do a quick check to make sure they have all those invoices. I assume it’s also good for you because it means that you can then say, “But we did send you a statement” if they subsequently say, “No, I didn’t get that invoice. I don’t know where it’s gone.” Charlie, what would you advise your clients? Charlie Eve: Yeah, most people raise invoices at the end of the month, and then they might send out a statement a month later. Well, you should send out a statement two weeks after you’ve sent out the invoice, depending on your credit terms, so that they’ve got the statement before they’re due to make the payment. The important thing about cash collection and credit control is that there’ll be a lot of people at the moment who may even be in front of you for getting the money. It tends to be the one who shouts the loudest that gets paid first. I totally agree with what Carol is saying about an e-mail, but if there’s no response to that within one or two days, then you need to get on that phone and you need to start talking because it’s much harder for someone to speak to you on the phone and try and give you a valid reason as to why they’re not paying than it is for an e-mail to come into your Inbox and to be shifted to a little folder which says, “I’ll deal with later,” maybe three months’ time. Julie Stanford: Yes, this person isn’t shouting loudly enough. This is just a digital shout. Charlie Eve: That’s right. It is. We’re all human beings and you hope that we’ve all got a conscience and if we’re in business, then we’re going to be in a position where we have to chase for money so, yeah, let’s talk to each other and try to get money in as well as pay our suppliers. Carol Lewis: The other tip I’d give on credit control is, if you can, try and get people on standing orders. Say for example, you’ve got a customer and they come to you and they say, you know, and they go and say, “I can’t pay you at the moment. I don’t have the funds.” You can go and say, “Well, okay. Why don’t you go and pay me £100 every month for the next how many months until it’s paid off?” Because you’d be surprised how quickly that time goes and it’s paid off or at least, each month you’re getting some money in. Julie Stanford: I think that’s a good idea because people, sometimes businesses, think it’s either all or nothing, don’t they? Julie Stanford: Often, we’re saying this as if actually the client isn’t wanting to pay, but sometimes they just can’t pay, can they? Carol Lewis: They just need the time, don’t they? Julie Stanford: They’re looking for a creative way to get round that, or a reasonable partnering way to get round that. In terms of credit control, just to really touch on the next stage just because it’s good information to have, because we’ll all at some point have that challenge of someone who won’t pay, what would you do next? If that’s ignored and they’re not coming back to you with the suggestion of staged payments, would you put that on paper, or would you still be making the phone call? What’s the next stage, Charlie? Charlie Eve: I think what you have to do is make sure, if your business is more than one person, you need to make sure everybody in that business knows that. Because the last thing you want to be doing, if they’re not paying that, is to be providing additional services. The account has to go on hold and make sure that amount that is a potential for a bad debt doesn’t increase. Then you need to have regular communication and try and find out a little bit more about that business, whether it’s just you that they’re not paying for whatever reason. I suppose, you have to keep communicating, keep sending out statements. Potentially, you might have to take it further and look to try and reclaim that debt via the legal route. Julie Stanford: Yes. Carol Lewis at Bainbridge Lewis, do you find that your clients struggle with that notion of getting on the phone and being firm? Carol Lewis: Yeah, everyone is really scared, but it’s actually really effective when you do it because … Charlie’s quite right. It’s the human touch that really works but everyone’s really embarrassed, I think, to call up and say, “Pay me.” It’s a really English thing, isn’t it? You’re embarrassed to go and ask for the money and a lot of people are really reticent about getting on the phone and doing it. Julie Stanford: Yes, I think it’s a common … A lot of businesses say that to me, that there’s just a point where they feel like they wish it would just sort itself out because it’s hard to do. Julie Stanford: That’s an excellent tip because it shifts the blame and, as you say, you can keep the good relationship with the client while you blame the harridan in the office who’s going to ring you up and chase the credit control. Employee records – what four pieces of information should you be keeping? Julie Stanford: Now we’ve not got a massive amount of time left, but let’s use the last five minutes, really, to think about then employee records because this is one area that businesses really struggle with which is wages, keeping personal information. Carol, tell us a little bit about if you’re an employer, what records you have to keep about your employee’s wages, basically? Carol Lewis: I did go and check on the Revenue website earlier and they did go and say there’s four things you need to go and keep. There is details of all the payments of wages that you’ve made to all of your employees, details of all the deductions that you’ve made from their salaries, details of any benefits they’ve received so, like, company cars or medical insurance, and also details of any, like, pension or anything else that they’ve had. Those are the four things, but they don’t actually have to be physical bits of paper. It could be all on a bit of software. The Revenue do give you free software to go and run your payroll, so it could all be on there that all that information is stored. Julie Stanford: Because it means they have access to that. Julie Stanford: Charlie Eve at Carpenter Box, would you advise your small business clients to do anything different to that? Would you expect them to do something more than those 4 items? Charlie Eve: Those four items are key for making sure that the correct payments are made to the employees. You have to have their full name, address, date of birth, national insurance number. When you’re doing the year-end returns, you need all that information as well as a payroll number for your business. Yeah, with employees because, again, it’s the human side and they’re reliant on the money because it’s the one payment that you have to make each month or each week because everyone’s got to pay their mortgage or rent or buy their food. You don’t want to get it wrong. Sometimes with that it’s take a little bit of advice up front but doing wages and payroll, you can use the Revenue and you can get it right. Julie Stanford: They are quite supportive actually, aren’t they? Julie Stanford: To help you become a good employer and keep good records. Charlie Eve: That’s the one side of the Revenue that I really do think that they help out. Julie Stanford: The friendly side. Julie Stanford: Now I’m going to ask you, and I’ve put you on the spot now because I like to ask expert guests for a tip. It’s a frustration you have maybe with your clients. What would you love them to be doing or what do you think they should be doing, Carol? Carol Lewis: Just taking more of an interest in their figures. I think there’s so many interesting facts about your business to be gained from your figures, looking at them, things like your margins, things like which customer makes you the most money and this kind of thing. I find it really interesting when I go into my clients’ records and start analysing their business. It’s really good for them to start taking an interest in their figures and looking at it as well. You can get to learn some really unexpected things. You spend so much time working in the business that sometimes you don’t stand back and have a look at the big picture. Julie Stanford: On great tools for planning your business. Quick tip from you, Charlie, before we close? Charlie Eve: Keep your records up to date. Charlie Eve: Because what’s the point? You can’t make a decision on information that’s a year old. Charlie Eve: You need to keep everything up to date. Julie Stanford: Brilliant. On that point of a very firm advice from Charlie Eve at Carpenter Box and Carol Lewis from Bainbridge Lewis. Thank you very much for joining me on Essential Business Radio.